Hacktag is one of those games that has existed in the relative obscurity of Steam’s “Early Access pile” for some time while it’s being given the love and attention that it deserves. This means that, as a connoisseur of co-op multiplayer games and quirky indie games, it’s something that my close friend and I have been dipping our toes into periodically for a while. One of you plays a Stealth Agent using guile, computer know-how, and cat-like grace to go through the building while your partner – once given access to the network – can hack into and infiltrate remotely. Both of you have a selection of abilities and perks at your disposal, choosing up to three per mission, to help make your technological heist a success. The premise of the game follows that very common Hollywood trope that you see in “infiltration” scenes of movies where one person is stuck in a spot of bother and cannot escape, until a peppy little voice over the communications system says, “third door on your right; I’ve unlocked it for you!” Surprisingly, it captures this feeling and balances the asymmetric nature of the two roles very well. 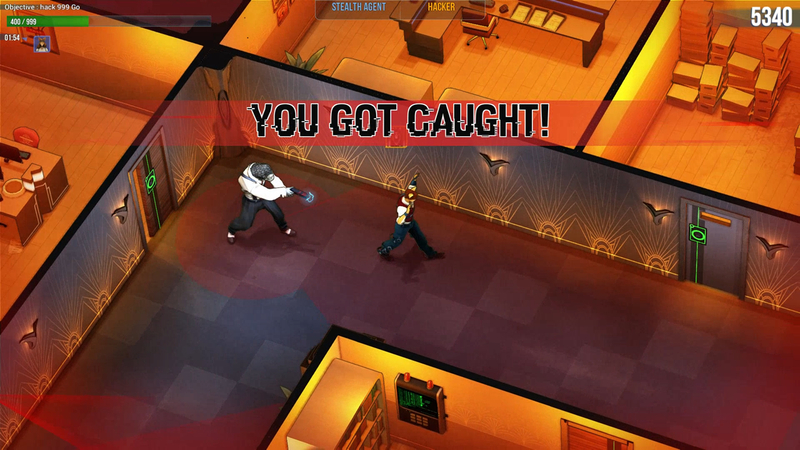 The game imposes miniature checkpoints that will require both of you to bypass, such as hacking doors together, mainframes, alarms, and always your final objective. Similarly, there are points that you cannot bypass yourself and will require your partner to create that opening for you through a series of arrow key quick-time events. While playing as the Hacker, your duty is to unlock doors for your Stealth Agent. 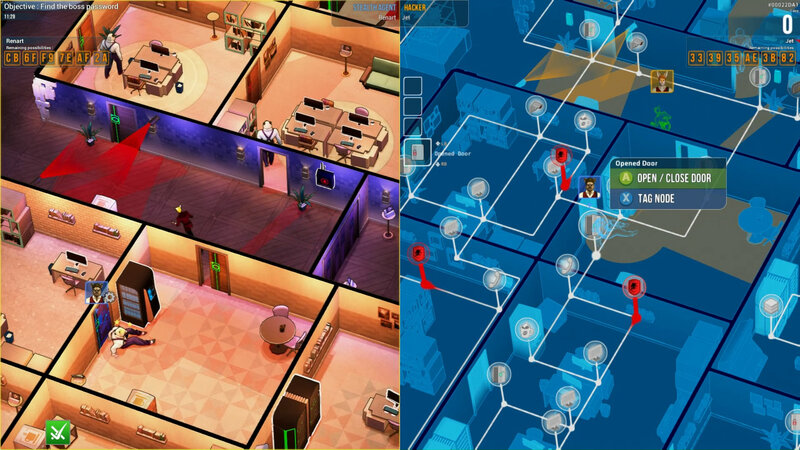 While playing the Stealth Agent, you need to unlock various firewall points throughout the level to grant your Hacker partner access to the next part of the network. Each role is not without its dangers, though, and you will have to do your best to avoid them as a team. The Hacker must deal with antivirus software and scanners that secures the network along set paths. Being caught by the antivirus will cause the Hacker to be quarantined in a server node where the Stealth Agent will need to manually free them from, lest the imprisonment timer ends and costs you a life. 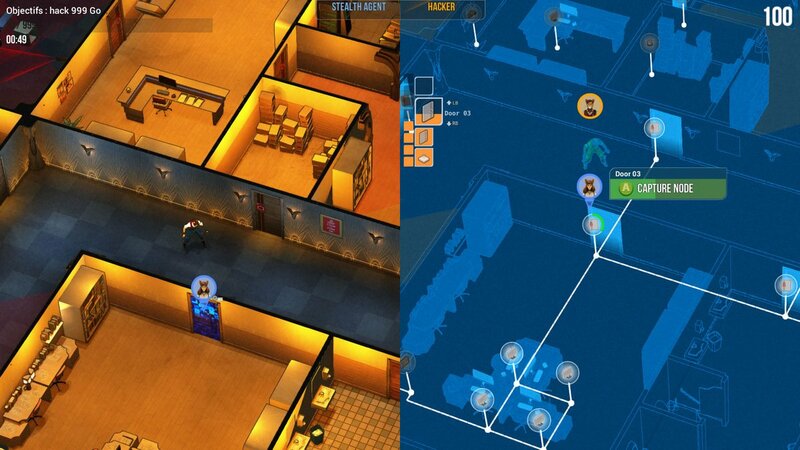 Similarly, the Stealth Agent will have their own obstacles to avoid in the form of guards patrolling the level, which means that being caught will put the Agent in a similar position of imprisonment that the Hacker will need to work fast to overcome. The asymmetric design of the game comes into its own when you start to learn how to work together to remove obstacles from each other’s paths and ensure safety for your partner. The antivirus and other forms of scanners can be stopped temporarily by the Agent if they happen to be at the node it’s patrolling – a simple press of a button and that thing is halted in place for a few valuable seconds. In the same way the Hacker can lure guards with telephone calls, turn off cameras, and slam doors on anyone walking through them. The two vastly different play styles have been merged together incredibly well to create a game that’s unlike almost any other co-op experience out there. Communication is key, so it’s always advised to play with friends that you can talk to through voice communications. This is because while you’re playing the game – especially as the Agent – you’re unable to really see the world in the same way that your partner does. It’s the hacker that has the best overview across the entire level, as they can see both the network paths that they can traverse as well as a blue matrix-like virtual construct of the level. Like the aforementioned movie trope, it’s the hacker that has eyes on everything, but even that does not give the full picture of what the Agent on the ground is seeing. I find this separation incredibly interesting, as it provides something that we rarely see in games and harks back to the Call of Duty: Modern Warfare 2 “Spec Ops” missions, specifically the Overwatch mission, that puts one player inside the AC-130 watching over their friend. 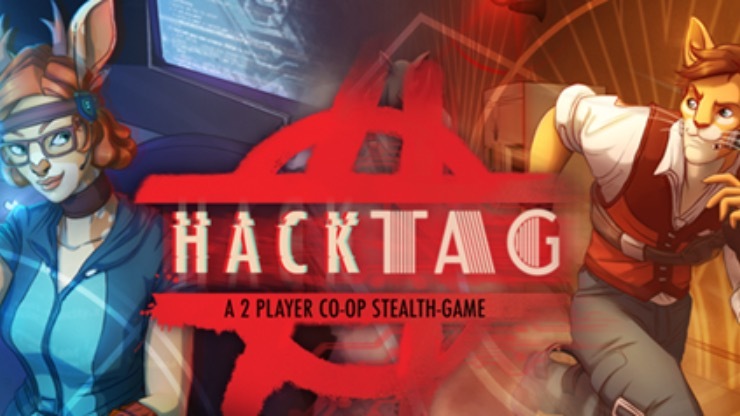 It’s strange that this kind of co-op experience isn’t seen more often and I am happy to see Hacktag adopting this as a core concept of the game. Aesthetically, the game mixes the current-day technology of computers with 1930s fashion on anthropomorphic characters in an isometric level design. Why we have anthro characters I have absolutely no idea, but it’s strangely quaint and I’m okay with that. There is one thing that made me groan a little inside, and that’s the Loot Safe mechanic. Not to get political on this front, there is still some stigma to this mechanic, but it doesn’t seem like Hacktag are using this as an alternative revenue stream. Loot Safes are awarded on mission completion and cost nothing to unlock, granting only cosmetics for your characters from clothing colours and accessories to skin/fur patterns for character creation. There are coins awarded, but in this current build of the game there’s nothing that they can be used for. Whether this was intended as additional revenue that ended up being changed, or perhaps something that will be implemented fully later will remain to be seen. Rather than a random selection of three items per box that requires quitting the lobby to open, a random item could have been awarded in its place negating any need for the stigmatised system of loot boxes. Hacktag is a wonderful experience and a fitting example of how asymmetry can create an interesting dynamic of gameplay and teamwork. I know that when my friend and I play this game we both have our preferred roles – mine being that of the Hacker, and his being the Agent – but it’s also a lot of fun to switch between the two. The only concern I have for its longevity is that there are a finite number of puzzle types to solve and these can quickly become an almost-routine obstacle that takes little effort. That said, even a puzzle you’ve seen before can cause untold nightmares in a procedurally generated level, when coupled with obstacles that you underestimate. Hacktag is a wonderful experience and a fine example of how asymmetry in gameplay design can create an interesting dynamic of teamwork. It’s a unique spin on co-op games that is worth you and your friends’ time.